Whether you are having a party or just playing with family and friends, a good game is what will make your time full of fun and memorable. Dart is one such game. Dart game will take the fun to a whole new level and offer the much needed exhilarating experience. If you will be playing outside, you have to consider acquiring an outdoor dartboard. Since there are numerous types of outdoor dartboard available, you definitely want to go for the best. Choosing the best outdoor dartboard can be a daunting task given that you might be operating under a tight schedule. 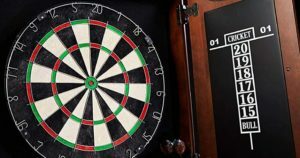 This article seeks to make your work easier by presenting nine ideal outdoor dartboards for your backyard. 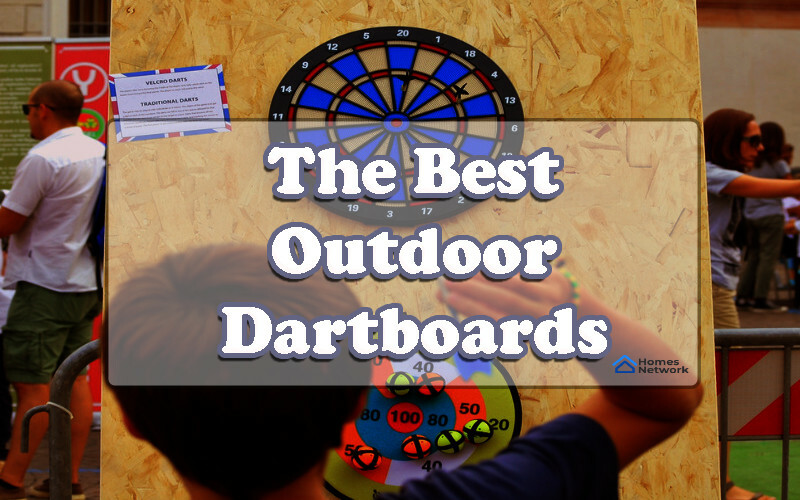 We will first go through the best part of reviewing the outdoor dartboards and then I will guide you on how to choose suitable outdoor dashboards. It is important to note that you have to make specific consideration when choosing a dartboard for outside given that it is exposed to harsh weather and other environmental conditions. Here are nine outdoor dashboards. 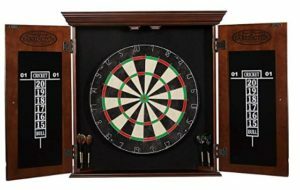 Barrington bristle dartboard cabinet set includes an 18-inch board and all parts required for a regulation dart game. The bull eye target is staple free to increase its life span and resilience. The other parts include flights, mounting bracket, marker, and six steel tip darts. A custom cabinet case makes it ideal for outdoor gaming. The case has sturdy joints for with quality hinges to protect the door from wear and tear. You can hang it on any wall. 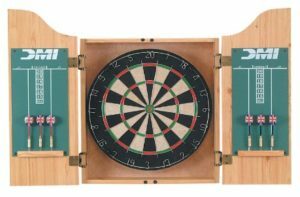 This dartboard also comes with a hard dartboard case which includes a light, large and easy to install regulation size target face. The arcade wood allows you to keep track of your scores easily. With a novel appearance, this is definitely a suitable dartboard for outdoor playing. Are you looking a quality dartboard? Well, I present to you this dartboard from Switzerland. Made from either mahogany or oak, this dartboard can stand the test of time. It is also made of bronze screws and self-closing hinges. 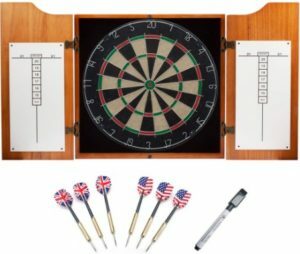 This dartboard set also includes a white dry erase scoreboard conveniently located inside the doors. A paddled black felt is placed on the backboard. The set also includes a self-healing bristle dartboard with six brass steel tip darts and movable number rings. 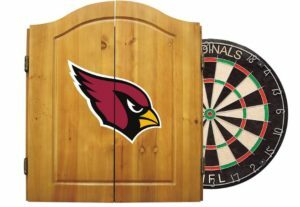 Since it is made of solid wood, it is a great dartboard for bars and man caves. If you want to enjoy an exhilarating outdoor dart game consider acquiring this dartboard. Whether you prefer cherry or oak finish this dartboard set got you covered. With a finger joint frame construction, the light cherry finish holds two sets of darts. A unique feature about this dartboard is that it caters for both the old school and modern generations. This means that you can opt to use the traditional scoring on one door or the electronic door on the other side of the door. It hides the dart when not in use and protects the door from stray darts. It comes with everything you need to kick start your game including a bristle dartboard. If you are looking for a dartboard for an outdoor game, this should be in your list. 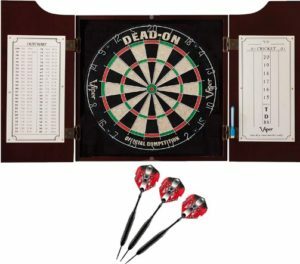 This dart set features an official bristle or classic dartboard bundle and a solid, classic wood cabinet. The cabinet comes with a mahogany finish. It is crafted with bronze hinges and solid pine. The dashboard is made from bristle/ sisal fibers to increase durability. 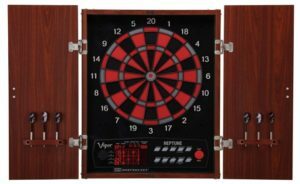 This viper dartboard also includes mounting hardware and dry-erase scoreboard. In addition, you get steel tip darts and movable ring. This dartboard gives everything you need to optimize your darting experience. The aluminum shaft which has a locking hole improves the stability. This dartboard is visible even under intense lighting from energy efficient and bright laser. Kings Head is an innovative dartboard that will take your dart playing experience to another level. What makes it endeared to players is the self-healing sisal fiber. You will love playing with the six steel tip darts. With an official diameter of 18 inches, it comes with wall mounting hardware and cricket scoreboard mounted on the door. It literary comes with everything you need to start playing. 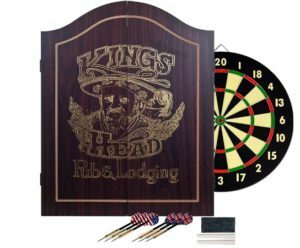 What stands out in this dartboard is the vintage style art of the king’s head. If you like artistic finishes this is the dartboard you should go for. Are looking for licensed dartboard? Then this is your dartboard. It is officially licensed by the NFL. It is one of the best dartboards you can ever buy. It is set with steel bristle darts and dartboard. One of the best features is that it comes with a team logo on the door. On the interior, you will find the team logo and name. It is made from solid pine wood for novelty, sturdy and classic look. The set includes six steel tip darts that have an NFL logo and names on the flights. In addition, you get an eraser, chalk and two scoreboards. Great dartboard for true fans! 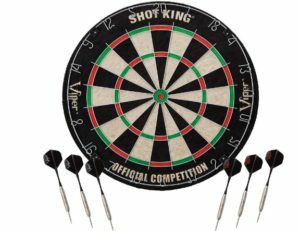 Viper Shot King is an official tournament size dashboard with a diameter of 18 inches. It is made from compressed fiber and sisal bristles hence more durable. A movable number ring extends the durability while the bull’s eye which is staple-free prevents bounce outs. It also has rounded galvanized wires which are very thin. These wires allow darts to slide and fall in the target area. The best thing about this dartboard is that it accommodates both soft tip and steel tip darts. This dartboard is designed with a rotatable dartboard and removable ring to allow fiber healing. This feature improves durability. It is suitable for people aged 13 and above. There are complaints from some customers that the dartboard is not self-healing, but this is debatable. 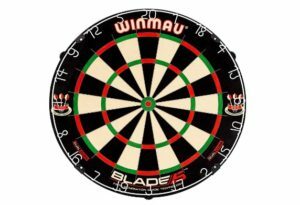 Winmau Blade 5 is probably the most popular among professional dart players. Well, it among the best dartboards out there. What makes this dartboard so special? First, it is endorsed by the British Darts Organization. It has a thin wring system that enhances the scoring potential. The razor wire angle has been reduced by 30 degrees hence improving dart deflection than the previous blade 4. It also has reduced bounced rate. One feature that makes it suitable for outdoor playing is a triple wheel and level system that can secure the dartboard at any surface. The bull eye ring incorporates carbon diffusion technology that makes it incredibly durable. This is definitely a top-notch dartboard. This electronic dartboard from Neptune has a sturdy construction to outlast years of wear and tear. A big catching ring provides a landing place for missed shots hence protecting your walls from damage. The spider board has a large surface area that reduces the bounce outs and increases landed shots ratio. A unique feature about this dart is an extra large LCD where you can view scores of up to four players. The six-inch display is designed for expert readability. Using this electronic may seem like an exacting task but it has been clearly labeled for easy menu navigation and gaming. To operate you simply press eliminate, miss or bounce buttons. You can use the shortcut button to play Count up, 30 or American cricket instantly. Viper Neptune door is designed with dart holsters which display and store six darts. You can use these holsters for safe storage of the two sets of darts. The design of Viper Neptune dartboard makes it an ideal dartboard for outdoor use. Hang and take off before and after the game because you can not let electronic dartboard to stay outside. What material will your outdoor dartboard be made of? The material used to construct the dartboard is the single most significant factor. Different materials differ in quality. For instance, certain kinds of materials are more vulnerable to rain and other weather conditions. When exposed to rain the fibers will eventually come out. Similarly, wood dartboards will form mold when exposed to wetness. If you want a dart that will tolerate moisture, then a rubber dart will do the trick. 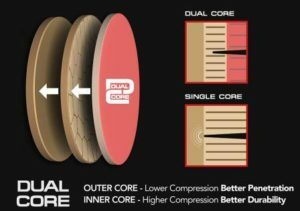 A suitable board should offer material depth and density. The surface should offer a perfect surface to penetrate and remain stuck. The most widely used dartboard is bristle dartboard. However, fine bristle dartboard can be quite pricey. If you are on a budget or just a casual player, you may want to consider an electronic dart. Better quality electronic darts are found on the pricier end of the spectrum. However, I suggest you take off your dartboard every time you finish the game. Because humidity can destroy every dartboard. So take care of it. When playing indoor dart, you might have a pen and paper to keep track of the screws. However, this might not be the case with outdoor darts. Ideal outdoor dartboard should come with embedded scoreboards. Hence you can keep the score regardless of the location. Usually, the scoreboards are stored behind the board while in other sets the scoreboards are placed behind the board. You will probably fix your outdoor dartboard somewhere outside hence exposing it to all manner of people including kids. As such, children will try to play with it. It is therefore imperative to acquire a dart cabinet. Dart cabinet will not only provide storage space for your dart it will also offer an aesthetic appearance. Most cabinets also come with extra features such as chalkboards or whiteboards. Bristle dartboards are most preferable but they get destroyed easily by wetness. If you are adamant about buying a bristle board the go for one that comes with a cabinet. The cabinet will keep your dartboard closed when not in use. When you want to play, you will just open and take the darts in the inner door. The dartboard will be at the center. Most cabinets are made of quality wood and sturdy construction. They provide a layer of protection if you have your board outside. 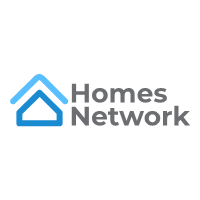 Do you want the freedom to move your dartboard around or have it fixed in one place? Choosing a mobile outdoor dartboard will prevent it from harsh weather conditions. An outdoor dartboard that offers mobility should be light and easy to carry around. It should have a hole or a hook somewhere at the back to help you hang it quickly. The wiring should strike a balance of low glare and high visibility for ideal aesthetics. The edging of the board should also be simple. Recent dartboard designs have classy ink and coloring. If you want to enjoy the game of dart while experience the spectacular view of nature and cool ambiance, you should consider purchasing an outdoor dartboard. I have reviewed nine of the best outdoor dartboard out there today. Since outdoor dartboards are mostly exposed to wetness, a waterproof dartboard will prove to be more durable. Before settling in particular dartboard ensure that you go through the guideline discussed to make an informed choice. Then go ahead and by dartboard of your choice, enjoy the game with family and friends.